What a place! Very central location and such fun people staying there and the staff were also incredible. Definitely recommend it! My friend and I stayed at four different hostel around Montenegro but this was by far our favorite! The rooms were comfortable, spacious, and cozy but the staff is what really made it unbelievable! They answered all our questions and concerns and really set this hostel apart from others. We were able to meet a bunch of international travelers on the pub crawl lead by Danilo who was fantastic! We look forward to staying again! 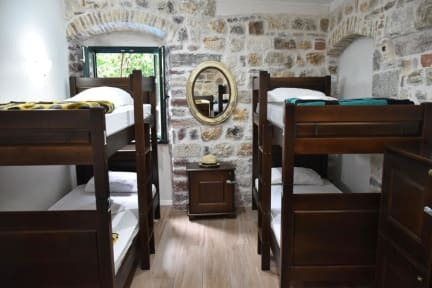 Absolutely stay in this hostel if you’re in Kotor! The beds and rooms are great and clean with free towels and curtains, there’s a pool (if you’re around in summer), and the staff is AMAZING! Special shoutout to Milan for being so fun and accommodating! I will definitely be back. Our stay in Kotor was made perfect by staying at this hostel. The staff were fantastic, in particular Milan who helped us by giving us some great recommendations of stuff to see and places to eat. The atmosphere at Old Town Hostel was awesome, people played games and drank most of the night in the lobby along with some staff. The condition of the rooms was great, very clean and the beds were quite comfortable. Would definitely come back to this hostel. What more is there to say? If you’re on the fence, book here. The staff are phenomenal (and crazy). The rooms are clean. The atmosphere is amazing. The location can’t be beat. I’m already heading back. Such a great experience. The Hostel in the perfect spot in Old Town to explore the city, the rooms are great, and the common area was so much fun! There are social gatherings every night and the staff goes out of their way to make everyone feel at home. The staff also tells you everything you need to know about the city, tours etc so you can make the most out of your time in Kotor. Can't recommend this place enough. I had such an amazing time at the Old Town hostel! 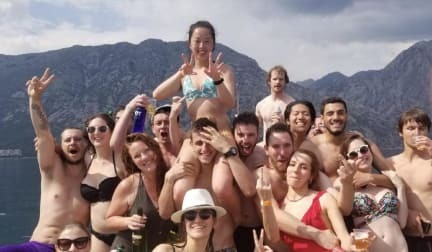 I’m sad I was only in Kotor for one night! Milan at the front desk was so so nice and helpful. I was looking for a book when I checked in and he went out of his way to find me one in English - and also wrote the sweetest dedication to me in it! When we checked out, he even walked me and my friend all the way to the bus station to make sure we made it to Dubrovnik safely. All of the evening staff showed us amazing night out too. Stay here! Amazing location, cool staff, fun nights, glad stayed extra. 2-4 nights be my recommendation! Thanks for great time! Lovely place in an amazing location right in the heart of the old town. The room was great, very good value for money, and Marco was a very welcoming and informative host. I would definitely stay here again. Thanks! Perfect location within the Old Town. Friendly staff and there is always something going on in the common area each evening. Good value for money and each bunk had a drawer that you could lock your stuff in (although some didn't lock properly). Bit of a queue in the morning for toilet facilities as there were 2 rooms with a toilet and shower in, shared between 3 rooms ( miminum of 12 people) but that's pretty common in a lot of hostels. All in all I enjoyed my stay.